Looks like SLI on the Intel side is still a bit rough around the edges still, and may actually degrade performance a bit. Still on a while, the MSI P4N Diamond motherboard performs very well. After totally dominating the AMD market and giving AMD users a taste of SLI, it is Intel's turn to feel nVIDIA's wrath. I think it's safe to say that nVIDIA has already won the all-important "marketing" battle, as the nForce4 SLI Intel Edition chipset specs are more impressive than Intel's own 955X. MSI has built a pretty well rounded motherboard here. The MSI P4N Diamond with its nForce4 SLI Intel Edition chipset under the hood offers a lot of functionality, and gaming oriented features like, you guessed it - switchless SLI. 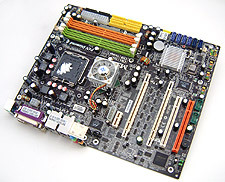 Furthermore, this Socket 775 motherboard supports all the latest and greatest Intel Pentium 4/XE, Pentium D and Pentium Extreme Edition processors which operate at 800/1066 MHz FSB. The P4N Diamond has a whole host of goodies such as an additional Serial ATA II/RAID controller, a Creative SoundBlaster Live! 7.1 soundcard, IEEE 1394 and dual Gigabit NICs. The P4N Diamond is also the only switchless nForce4 SLI Intel motherboard on the market. If MSI has missed something, there is an open PCI Express x1 and two open PCI slots for your upgrading pleasure. The motherboard itself is a breeze to work with. If an overclocking adventure goes too far there is an actual clear CMOS button to rest the BIOS with, instead of fiddling around with a jumper. MSI also includes everything but the kitchen sink with this motherboard, although I wish it would choose higher quality rounded cables. The MSI P4N Diamond is a high performance board and you better have good case cooling if you are planning on using this board for overlocking. Looking back at the benchmarks, we can see that the MSI P4N Diamond flew through the tests, often outperforming Intel 955X motherboards which is impressive. Things were even sweeter in 3D benchmarks although SLI performance was a bit disappointing in 3DMark05. The motherboard is a decent overclocker as well and I was able to push it as high as 253 MHz! With a retail price of $240 CDN ($212 US) the MSI P4N Diamond motherboard is darn fast, and anyone who picks one up will not be disappointed!